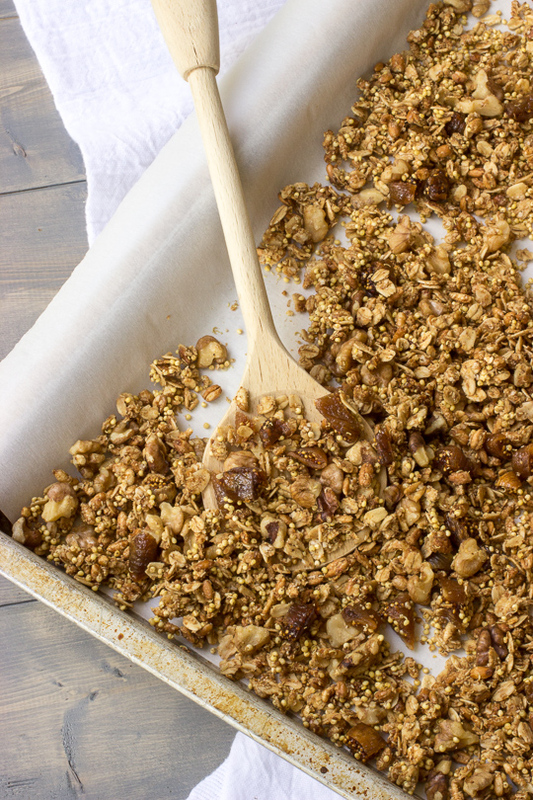 Slightly sweet, crunchy and delicious are the perfect words to describe this granola. I created this recipe with inspiration from my favorite granola brand you can buy in stores. I love brands that use minimal, natural ingredients and make it their mission to promote clean eating. While I do find it convenient to grab a bag of granola when I am at the store, nothing beats making it from scratch. You know exactly what ingredients your putting in and can vary it based on your taste preference. And that's part of the fun! So this granola had some specific criteria to meet before I could be satisfied. Gluten-free: I wanted this granola to be gluten-free and contain a variety of different ancient grains for texture and nutrition purposes. For this reason, I choose, to use a combination of oats, puffed rice, millet and quinoa flakes. Naturally sweet: I wanted the granola to be only slightly sweet. I used only unrefined sugars and applesauce to get the perfectly sweet glaze. Crunchy: Crunchy granola is a must. From previous experience I knew this recipe need some type of oil. I have made oil-free granola and it is just not as good. This recipe use just a touch of coconut oil. Granola is easy to change up by simple swapping in and out different ingredients. For this recipe I wanted to keep it simple but still keep it nutrient dense. I opted for walnuts, dried figs and maca powder, all of which provide something unique to this recipe. This is the powerhouse of nuts. Walnuts are are unique in that they are the only nut that is significantly high in omega-3 fats! They also contain disease fighting antioxidants and are a convenient source of protein, fiber magnesium and phosphorus. All of which are needed for optimal wellness! Figs are unique in that they contain more calcium, potassium and iron than many of your other every day fruits. Figs also are a good source antioxidants and fiber! 3-5 figs (1 serving) contain 5 grams of fiber! Fresh figs are not easily found in supermarkets unless their in season (August through October), but dried figs can be purchased year round and still contain the amazing nutrition benefits! A true superfood. Maca powder is a Peruvian superfood that has been used for centuries to enhance energy, increase stamina, memory, fertility and aid with hormone imbalance. Its powder comes from the root of the maca plant and has a slightly-sweet, nutty taste with a flavor reminiscent of butterscotch. It is extremely nutrient dense with vitamins, minerals, amino acids and plant sterols. This includes potassium, copper, magnesium, selenium, phosphorous and calcium, just to name a few. Maca powder is also fiber-rich and a source of plant protein! It's recommended that you only need a 1 - 2 tsp to reap its benefits. Snack: portion out about 1/3 - 1/2 cup of the granola into a snack bag and stash it in your purse or gym bag! Topping: sprinkle this on everything! I think it gives an awesome crunch to a thick smoothie bowl. Cereal: pour yourself a 1/2 cup portion of this granola and serve it with almond milk or another milk of your choosing. I hope you give this granola a try and are happy with the results! It's really is quite simple and is a significantly better choice than most granola out on the market. This is definitely a granola you can feel good about eating, since you that your fueling your bodies with whole, natural ingredients. In a large bowl combine the dry ingredients up to the coconut sugar. Mix until evenly distributed. Pour the warm liquid over the dry ingredients and mix together until all the dry ingredients are coated. Next, sprinkle the coconut sugar into the mixture and combine.